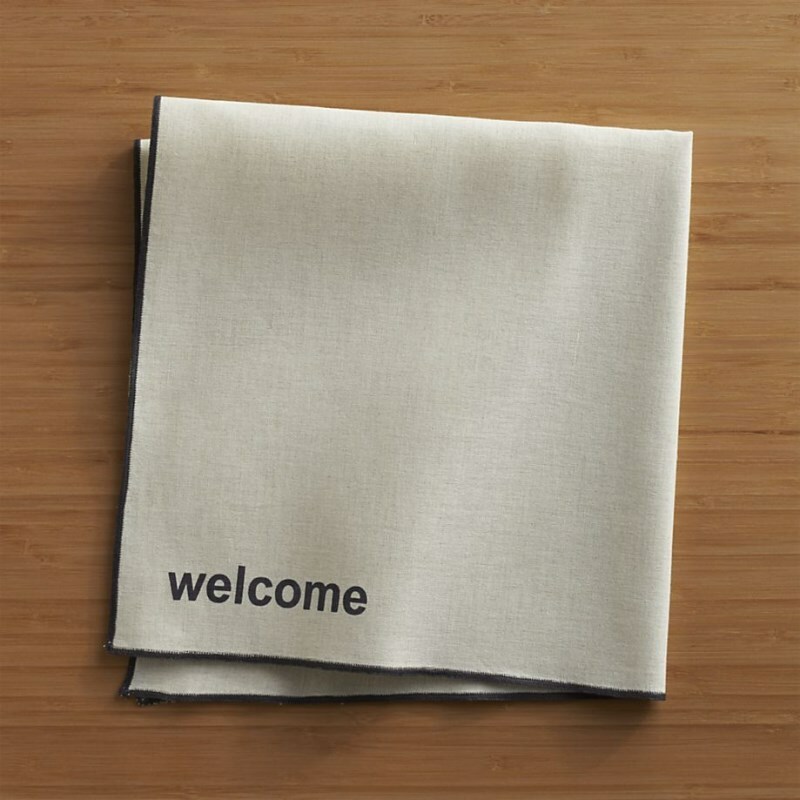 This Welcome Napkin from Crate & Barrel beautifully captures our dinner party concept: simple and chic, with a hint of upscale style. 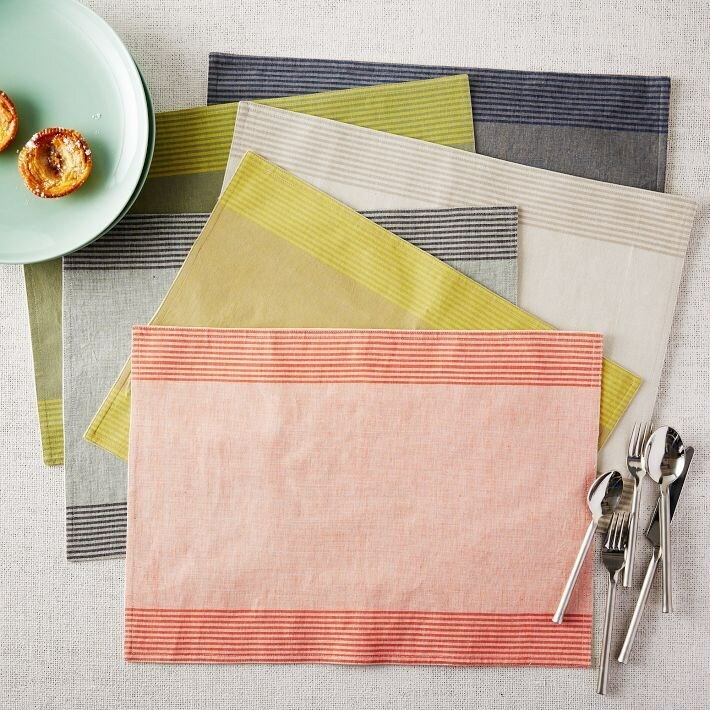 While the rich tones of the food will help set the palette for this gathering, don’t hesitate to add a dose of color with striped placemats, such as this Border Stripe Yarn Dye Placemat Set from West Elm. Go with one tone for a more uniform look, or mix and match them for variety. One of our favorite parts of autumn: the interesting tones of the fall moon. Let the moon be a source of inspiration. As this blood moon from Universe Today shows us (below, left), there’s mystery and warmth in the night sky’s celestial orb. 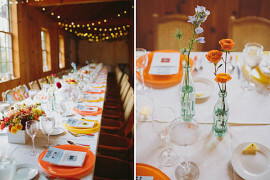 We’re also quite smitten with the moon party created and beautifully documented by Design Love Fest. Moon watercolor place cards are a magical touch (below, right)! 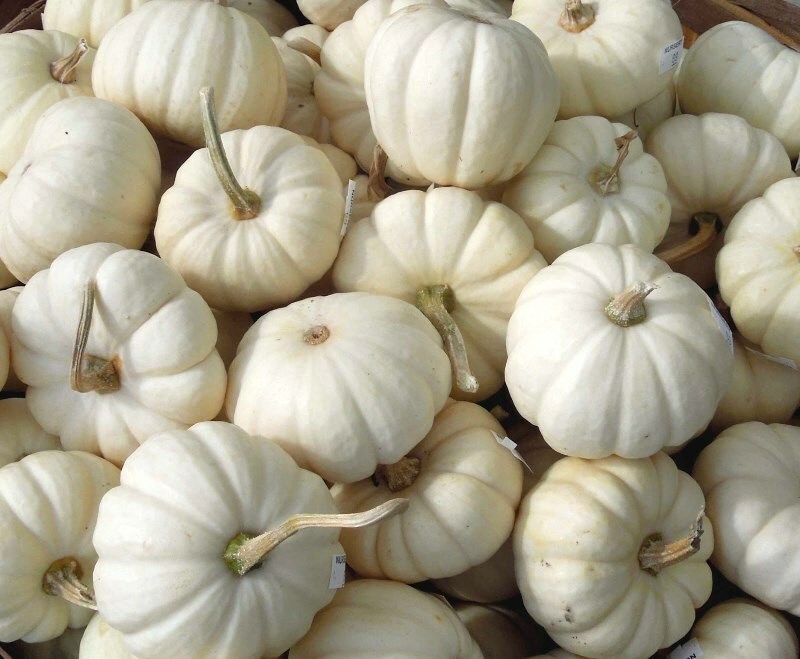 You can also put produce on display without veering into pumpkin and gourd territory. 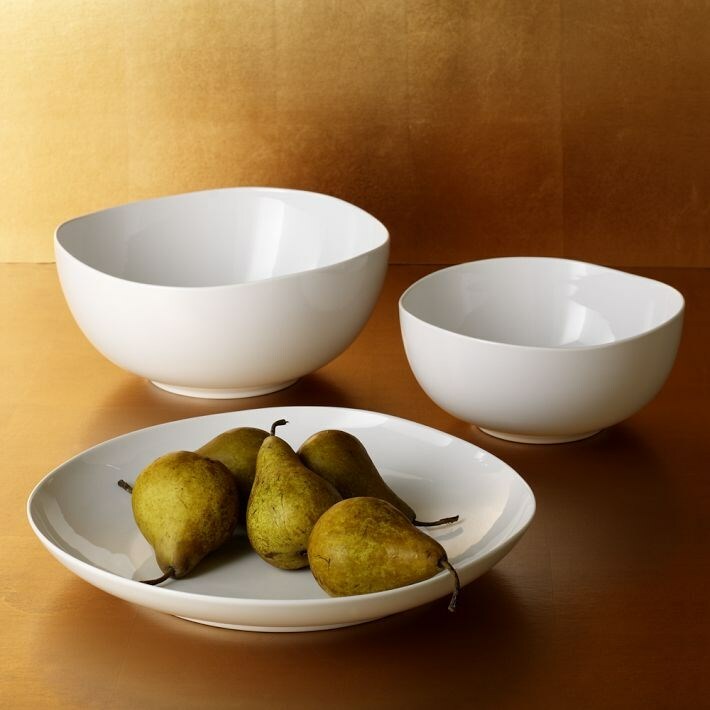 Set out a bowl of figs or pears for a decadent touch. 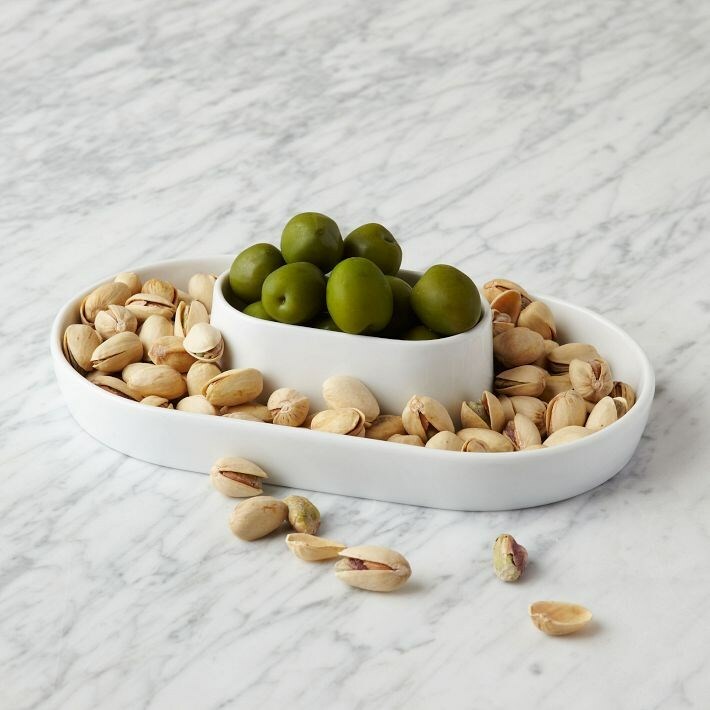 These Organic Shaped Serving Bowls from West Elm keep the vibe modern. With a chill in the air, let the flicker of candlelight introduce an element of warmth. 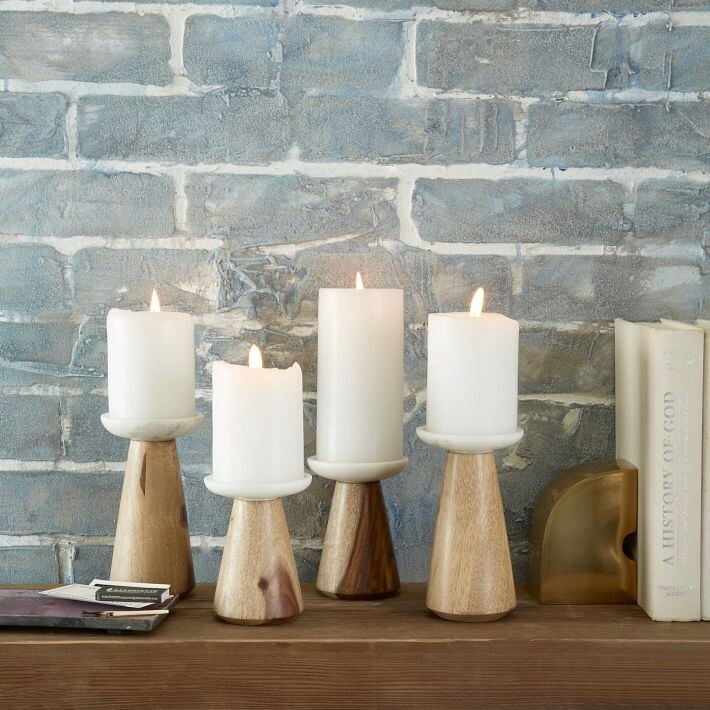 These Marble + Wood Candleholders from West Elm are the perfect platforms for pillar candles. Plus, they’re very on trend! 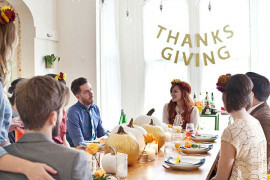 With the decor ready to go, it’s time to think about the menu for this dinner party. Our advice: Make it easy yet special. We’ll elaborate with the help of the images that follow. 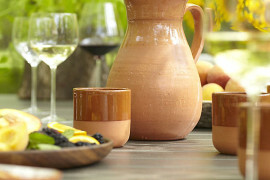 For starters, use fresh herbs to your advantage. 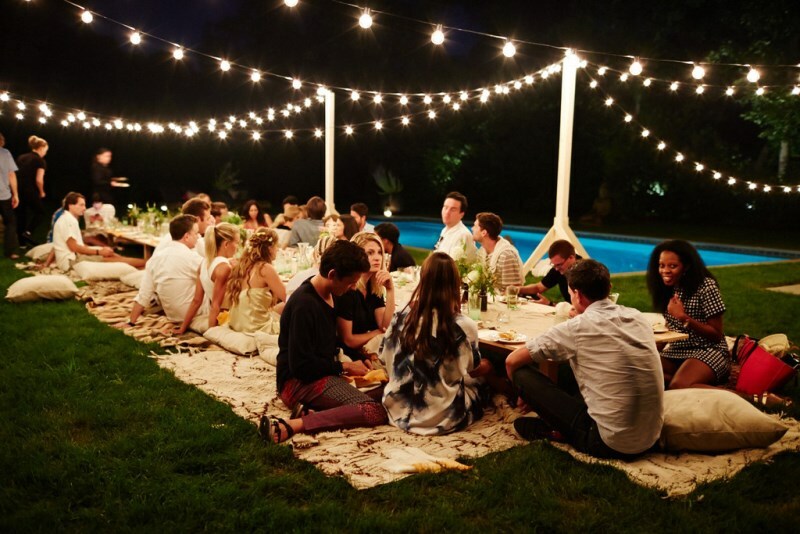 Remember the photo of Athena Calderone’s dinner party (at the top of the post)? Below we see Ms. Calderone prepare crostini topped with thyme, mint and parsley. You can’t go wrong with a cheese plate! It’s easy to throw together when you have quality ingredients. 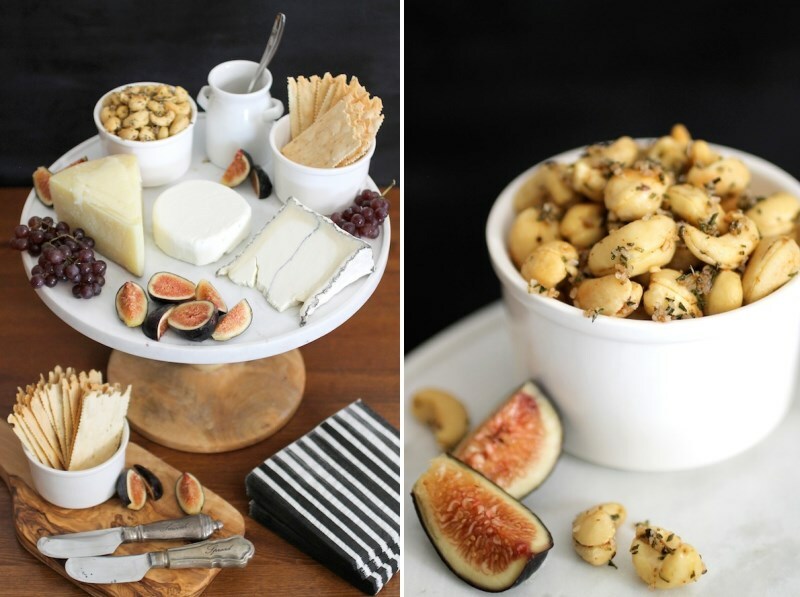 Below we see a Rosemary Cashews and Cheese Plate from Evite (designed and compiled by Jessica Bailey, Evite’s in-house party stylist). Her edibles of choice: a hard cheese, a soft cheese and a blue cheese, with plenty of crackers, champagne grapes, figs and truffle honey to go along. 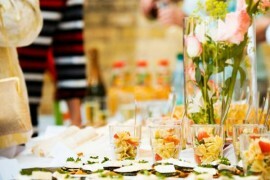 Since the appetizers for this party are easy to compile, it’s always fun to have one “special” item on the menu. Something that is beautifully presented. 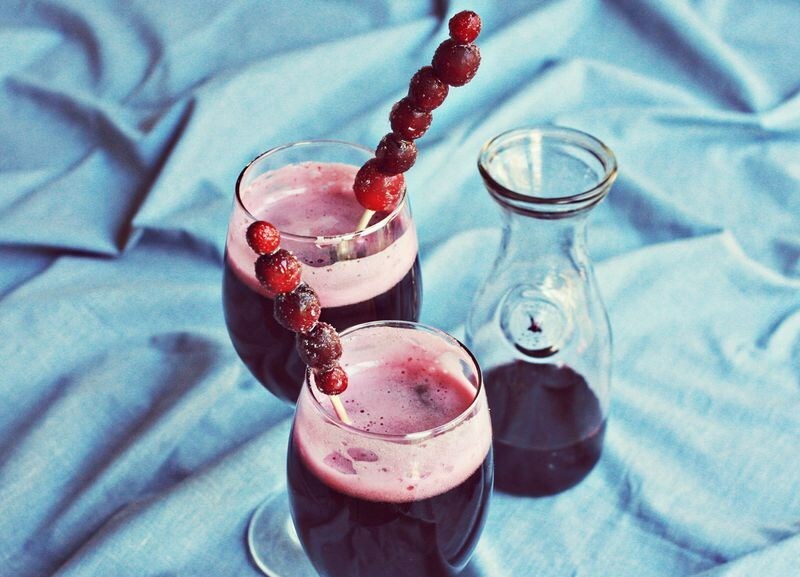 Something that takes your gathering up a notch. 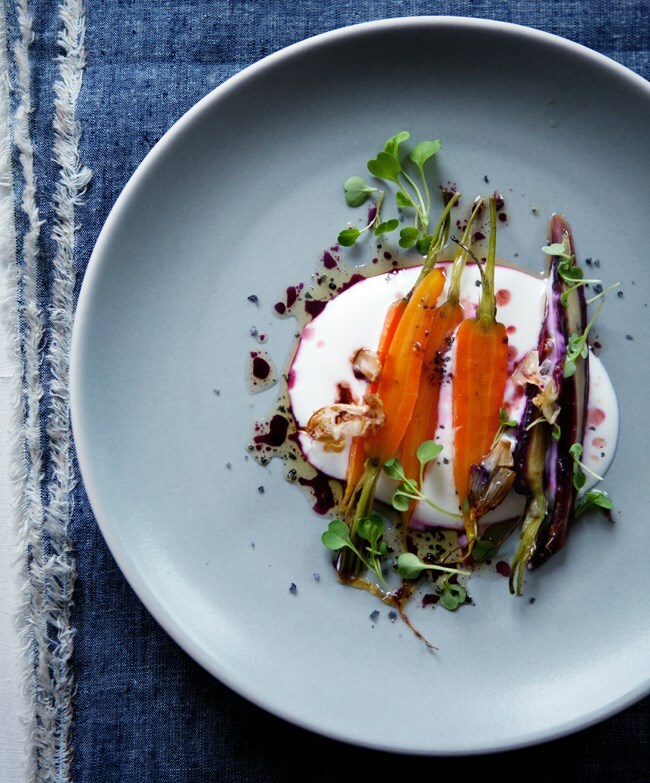 This recipe for Roasted Carrots with Honey, Sage and Garlic from Canelle et Vanille will do the trick! 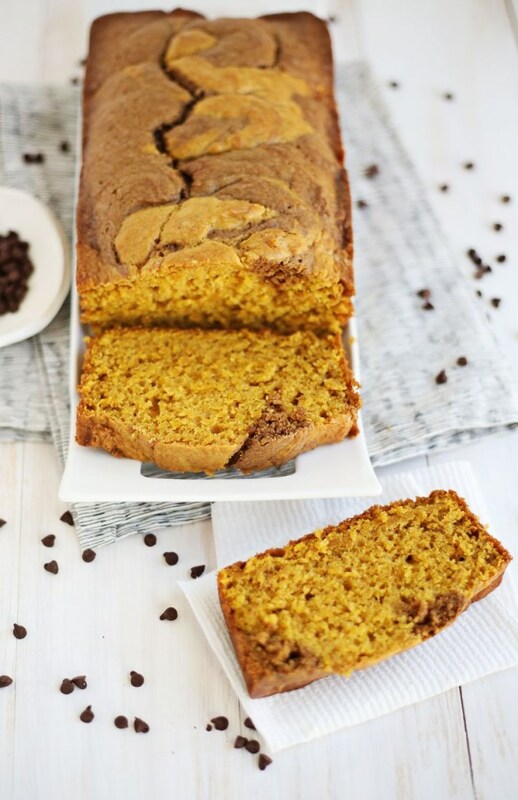 It’s easy to prepare, and as you can see, it’s undeniably gorgeous! If your guests enjoy meat, don’t hesitate to include a pork tenderloin, a roasted chicken, or another delicious selection to satisfy the carnivores! 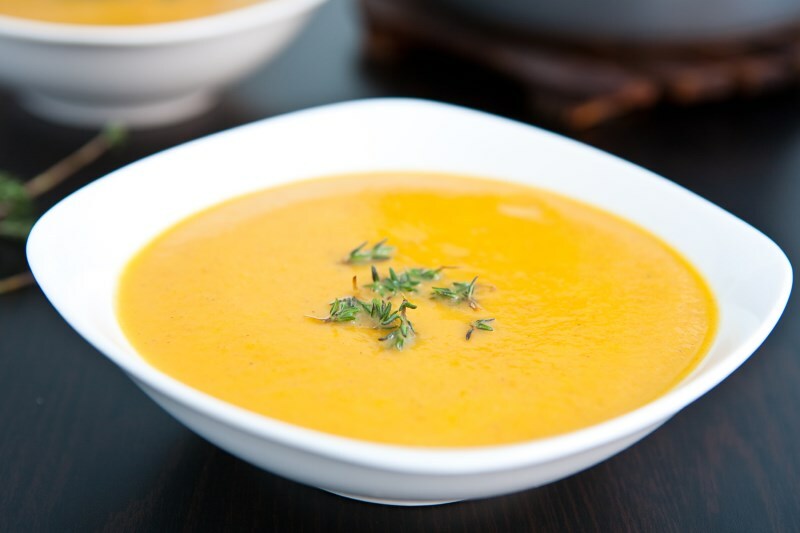 If you have vegetarians in the mix, this Coconut Curry Butternut Squash Soup from Eclectic Recipes is an ideal way to welcome fall. 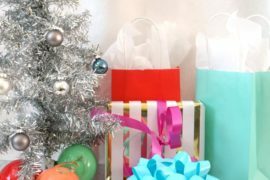 Plus, you can prepare a big pot of soup ahead of time, which makes your party prep that much easier. A delicious salad is a must, as well as a delectable dessert. 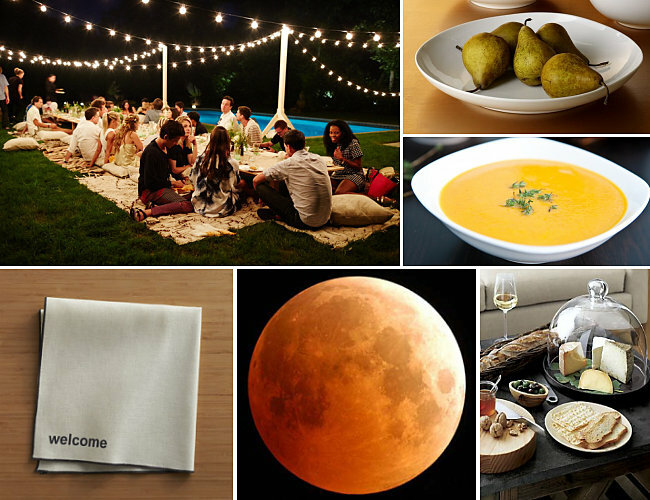 Check out Popsugar’s Ultimate Fall Party Menu for a collection of unforgettable recipes. 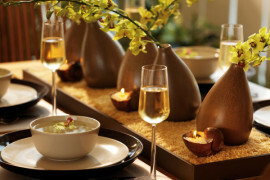 We can’t wait to try the Celery and Parmesan Salad, as well as the Apple Crisp Baked Apples (shown below). 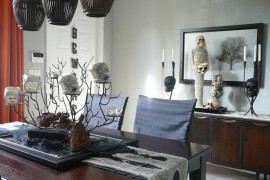 We at Decoist with you a beautiful fall! 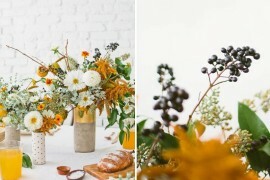 We’ll feature another autumn party concept as we get closer to Thanksgiving. 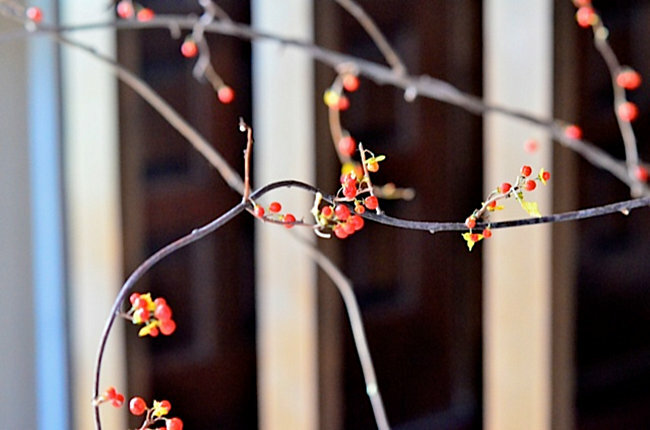 Until then, enjoy the beautiful weather, and don’t hesitate to celebrate the new season with delicious food and the people you care about.